Two different types of antenna arrays can be implemented in the Digisonde system. 7-antenna array is used for the DGS256 (DISS) system while 4-antenna array is used with the DPS system. Figure 1 shows two types of standard-per-manual antenna configurations. The DDA software features a generic scheme for antenna array specification that allows any possible antenna configuration to be entered. A variety of "standard" antenna configurations can be defined using DEVN, MAXSEP, and ROTATA parameters, and in a case of "non-standard" antenna setup, each antenna position in the array can be specified individually. Parameters LAT, LONG, CGPLAT, CGPLONG, COMPN referring to the station location are explained below. COMPNTD - Compass North Deviation (a.k.a. Magnetic Declination Angle). Positive angles correspond to the compass north deviation to the East of geographic north. Parameters MAXSEP, DEVN, ROTATA specify the antenna configuration itself. 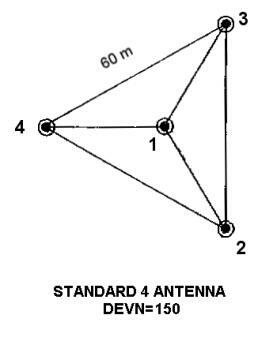 MAXSEP: This variable specifies the maximum antenna separation of the largest triangle in the seven antenna array configuration (Figure 1a). Namely, MAXSEP is the distance in meters from antenna 5 to 6, 6 to 7, or 7 to 5. MAXSEP always refers to the outer antennas of the seven-antenna system, even if they are not present (as for the 4-antenna setup of the DPS). In the case of the DPS where only four antennas are available, the MAXSEP is specified as the distance between the virtual antennas 5, 6, and 7. 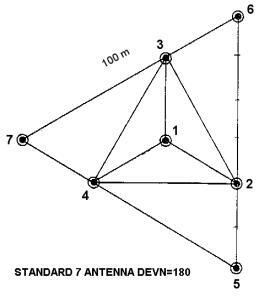 For example, in the standard DPS antenna layout, with 60 m long triangle side (distance between antennas 2 and 3) MAXSEP should be set to103.92 m. In this case, the DPS antennas 2, 3, and 4 are referred to as the inner antennas of the 7 antenna array. 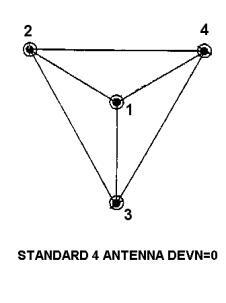 Parameter DEVN ("deviation") is defined as an angle between the direction to Compass North and the line passing through the antennas #3 and #1. This angle is counted counter-clockwise from the Compass North toward the "3-1" line (see Figure 3), taking values from -180 to 180. Figure 3. Specification of the DEVN parameter. ROTATA. This parameter (a) defines the antenna array configuration, and (b) also specifies the output coordinate system for skymap and velocity data calculated by the DDA software. Possible values for the ROTATA parameter are defined in the following table. Rotation Sense: This specifies the actual position of the antennas in the triangular array. 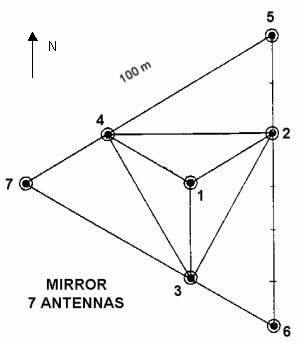 In a seven‑antenna setup, antennas 6, 2, and 5 are located west of antenna 1, while antennas 4 and 7 are located east of antenna 1. This antenna field is said to be a counter-clockwise rotating field since spiraling from antenna 2, 3, 4, 5, 6 to 7 the spiral is in a counter-clockwise direction. 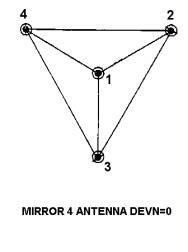 For the mirror image array where antennas 7 and 4 are located west of antenna 1 and antennas 6, 2, and 5 are located east of antenna 1, the spiraling from antenna to antenna goes in a clockwise direction. DDA antenna specification examples for some of commonly used antenna layouts can be found in the tables below. 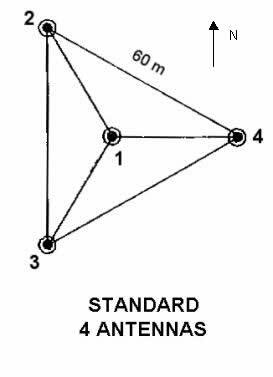 In the "standard" configuration, antenna 1 to antenna 7 are walked counter-clockwise. 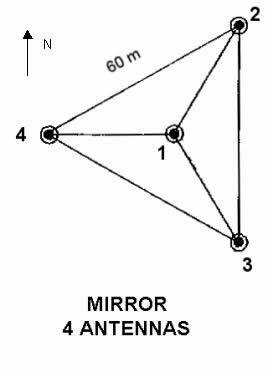 In the "mirror" configuration, antenna 1 to antenna 7 are walked clockwise. DPS working on the internal loop of the array configuration "MIRRORED 7 ANTENNA DEVN=0"
DPS working on the internal loop of the array configuration "STANDARD 7 ANTENNA DEVN=0"
Formerly known as "DPS ROTATED"
If the antenna array configuration is not one of the standard (listed above), such a non-standard setup is described by direct specification of each antenna coordinates in the lines 170-183 of the ddasetup.onl file or lines 080-082 of the Station UDD file. · Y forms the right-hand system (i.e., points to the West). Note: For non-standard antenna configurations, there is no need to specify parameters MAXSEP, COMPN, DEVN in ddasetup.onl file.